Starbucks was just a popular local joint in Seattle. But when celebrity influencers were consistently publicized going around tinseltown with their Starbucks drinks in tow, the cafe became an international symbol. This phenomenon rings just as true in the blogging world. 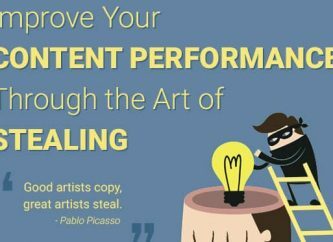 Yes, your content should be 10x quality—but all this could be wasted effort if you don’t have the right influencers giving you a significant leg up. When a Moz community influencer gave our app a mention, that sent us a ton of traffic, hundreds of signups, and is still one of our top referral traffic sources to date. No big marketing budget, no large PR stunts. Just the raw, simple power of influencer marketing. As the saying goes, you see, success in the blogging world relies not only on what, but also largely on who you know. So in this tutorial, I’d like to talk about how to get those high-power guests and experts come to you. And how you can use NinjaOutreach to help speed up this process. As you research deeper into your target niche, think about the blogs you frequently read and bloggers you look up to. I’m sure if these are your top go-to resources, you can recall their websites off the top of your head. 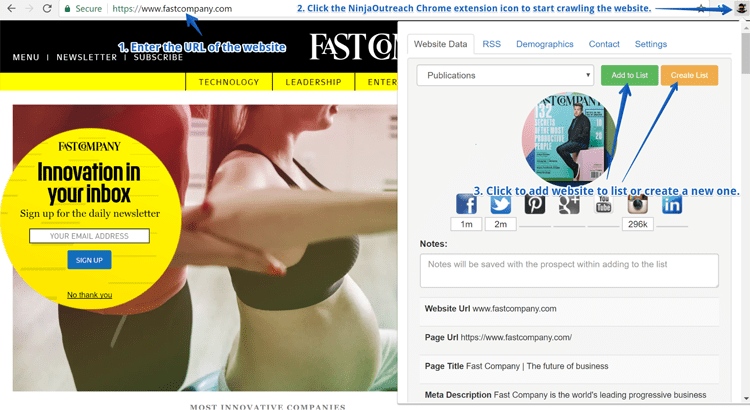 Next, install the NinjaOutreach Google chrome extension and integrate it with your web app. 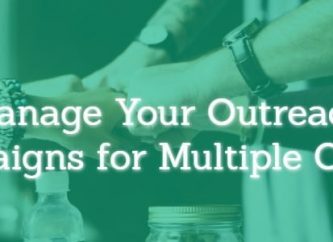 Once done, simply visit your favorite websites and blogger accounts, then use the NinjaOutreach Chrome extension to add them to your NinjaOutreach list. Of course, you can’t just stop with a few of your favorite influencers. You need to add to your list. Say you’re looking for influencers in the digital marketing niche. 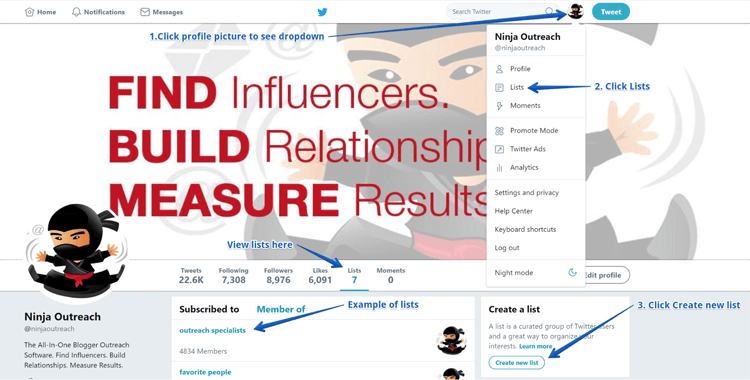 To do that, start with the NinjaOutreach Prospecting > Social Influencers tab, which combs through Twitter and Instagram accounts. Here, you can filter your results by number of followers. Enter your niche keyword, “digital marketing,” and hit search. Add any prospects that fit into your list. You can also do the same search in the Prospecting > Find Leads tab. In this tab, you can filter your results to by name, location, number of shares per post, domain, and page type. You can also choose to display only the results with available contact info. Again, add any prospects that fit into your list. Note that you can also use advanced search operators within the NinjaOutreach search platform. If you’re still short of prospects, you can head straight to Google and use varied combinations of your keywords + advanced search operators. Enclosing your keywords in quotation marks ensures an exact match from Google, while preceding a word with the - sign excludes any results that contain this word. In the example below, you can force Google to show exact match to digital marketing but will not include any results that have to do with strategy for beginners. In the next example, you can use multiple keywords in a single search by using OR. Enclose them in quotation marks for good measure, to ensure you don’t get any random results. If you find results that fit, import these to your NinjaOutreach list. Once you’ve finalized your prospect list, it’s time to start building a relationship with them. You can start this via a more traditional route: sharing the influencer’s content regularly and tagging them. Another thing you can do is to leave thoughtful comments on their blog. Not the generic (and honestly, increasingly irritating) “great post!” comment, but one that asks relevant questions and adds something to the discussion. For example, this comment below in response to Brian Dean’s honestly awesome post. 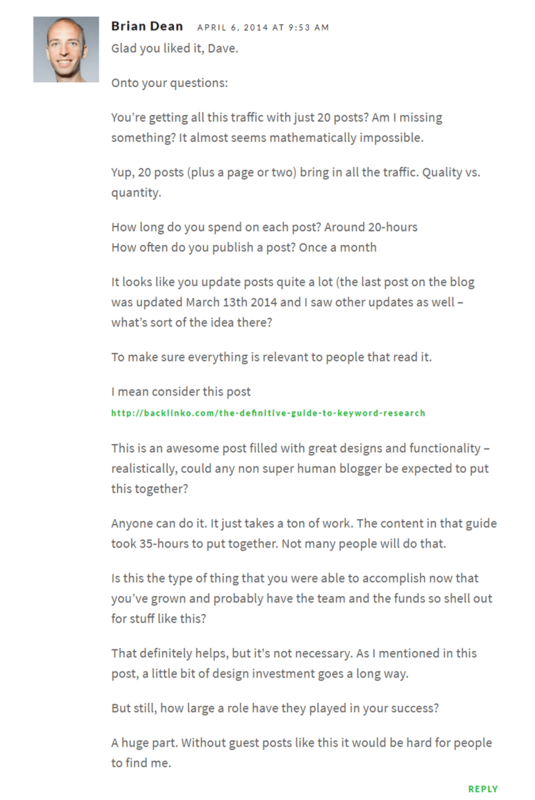 This lengthy comment got a just-as lengthy response from the intended influencer, Brian Dean. Once you've done these things for a while, maybe for a week or two (in more dedicated cases, they wait at least a month or two), it’s time to start your outreach. But a stern warning: your first outreach is not the time to pitch anything yet. Focus on building your relationship first. Ask for their input for a blog post you will write on a topic that is their expertise. Invite influencers for a video call/interview online. You can also add the influencer to a public Twitter list. If you found a really great article of theirs via the Prospecting > Most Shared Content tab, you can add it to a resource page in your website then send them an email about it. You can also write a blog post with a different point of view to an influencer’s trending article and call their attention to it once you publish by sharing on social media and tagging them, or sending an email. To stand out even more, you can also send a personalized, video message and tag them on Twitter. As you do this, track the reactions you do get, and update your relationship label with each prospect accordingly. Another stern warning with pre-written templates: don’t just send them as is. 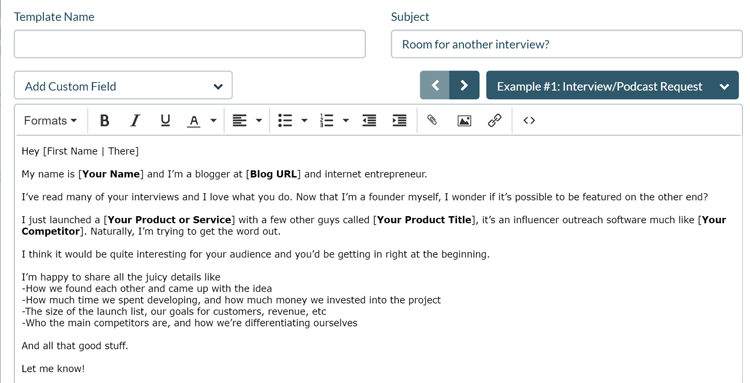 Take the time to review and modify your templates so each one you send is personalized for each influencer. Most bigger influencers receive tons of emails a day, so they will be more discerning with the emails they read. Make it worth their time and not like an obviously mass sent outreach message. As Ahref’s Tim Suolo said in his blog post about doing outreach right, those sorts of bad emails will go straight to the trash bin. Once you’ve finalized your templates, it’s time to set up your campaign. For follow-ups, we recommend setting up at least two automated follow-up messages for prospects that don’t reply. To monitor how your campaign is doing, if anyone’s opened it yet, read it, or responded, go to Inbox mode. Of course not all will respond favorably to your outreach, but just remember to update your relationship labels to track how your campaign affected your relationship with your prospects. Here’s how to manage your relationship statuses on NinjaOutreach. Keeping track of your interactions with your prospects will help keep you from making any embarrassing communication mistakes later that could cost you some goodwill. For example, if one prospect has agreed to give you a quote for your blog post, you can update the relationship label and notes to say so. This way, you won’t make the mistake of sending the same request again. Any edits you make to the prospect card will be recorded by date, so you’ll know exactly where you’re at and when any changes happened. Now, there are two scenarios: in this first scenario, your target influencer has given you the time of day to reply and issued a quote. You’ve written your blog post/expert roundup/editorial using material your influencer prospect has provided. Promote this content in every avenue you can think of and tag your influencer in it. Not all in a day, but one at a time. For example, send them an email that your content is done and that you’ll be posting and tagging them to your post on this date. Then, on the publish date, post your content on your Facebook, LinkedIn, Twitter—whatever social media account is relevant to your niche—and tag them in it. Wait for a reaction. If you don’t get one, try another avenue like posting on forums related to your niche such as Reddit or Quora. 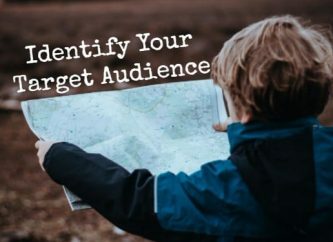 In the marketing niche, you can post in Growth Hackers, Inbound.org, etc. “Hey! 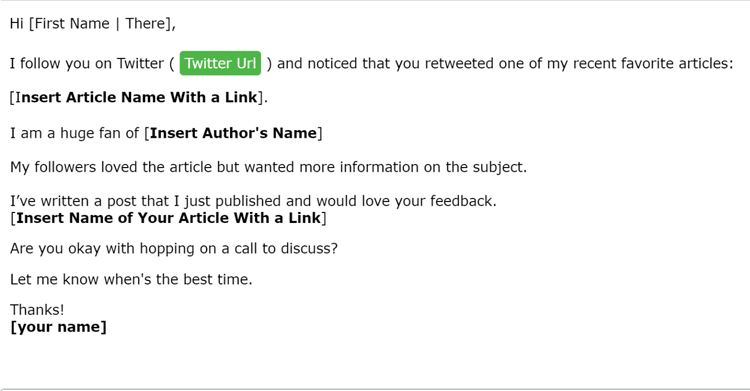 The article I wrote where I quoted you [link] is causing some debate in the comments section of [link to comment thread using the name of platform as link text]. Not all influencer relationships begin online. Sometimes, you can actually meet and network with influencers in physical events, such as trade shows, workshops, or conventions related to your industry. When you do meet your people, always start with an interview request or relationship building activity such as a casual, meaningful conversation about an article of theirs that you’ve read, questions about it, a different point of view, etc. If you do get lucky, you can get their contact info and add manually to your NinjaOutreach list. then choose the name of the list that you want to add your new prospect to. Click the add prospect button in the top right corner of the app to manually add a prospect, then fill in the details in the pop-up form. These details will then be saved into a new prospect card. After the event, you can then send your new lead an email or social media post to thank them for their time, then end with an opening to follow up. Here’s an example template from HubSpot. And of course, don’t forget to keep updating your relationship label in NinjaOutreach list as you go. Build your relationship from there and remember: don’t even think about pitching anything outright. The rule is this: Always do something for the influencer first. That’s how a Moz influencer ended up sending us tons of business. We provided the best help we could when he needed it, not pressuring for anything in return, and things fell into place. So do your research. 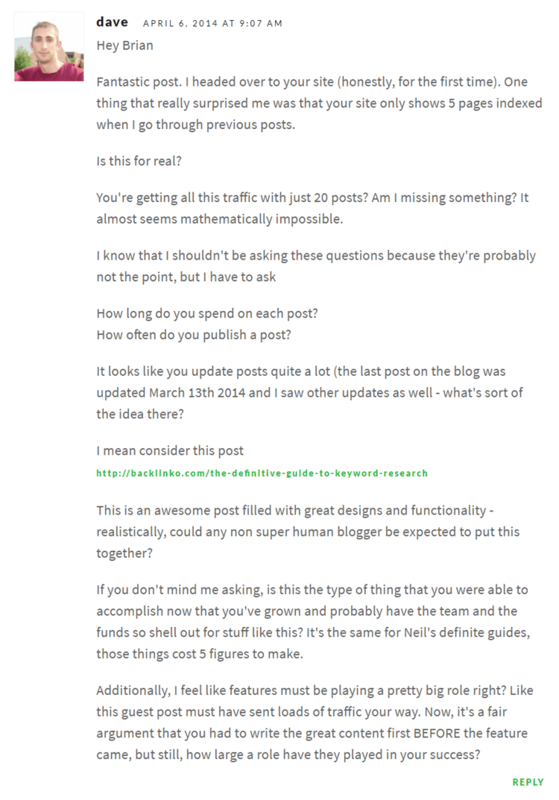 Write that blog post featuring everything you’ve learned from your talk with him/her. Write it well. Promote it. Tag your influencer. For all you know, if you do things right, an influencer might just promote you naturally and you didn’t even need to ask.